FORGOTTEN HOLLYWOOD showcases Movie Music and Standards from Hollywood’s Golden Age. 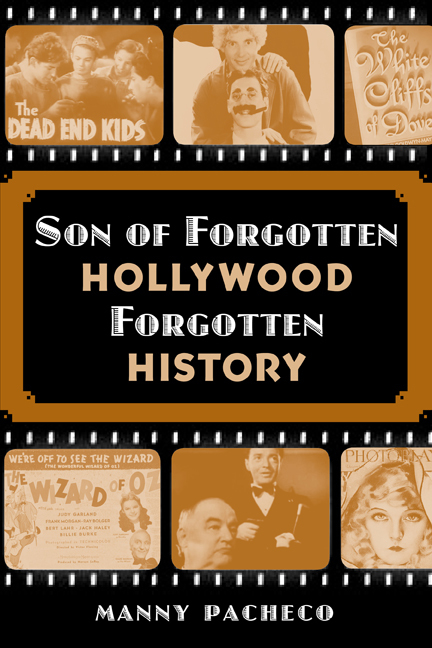 FORGOTTEN HOLLYWOOD also shares whimsical and nostalgic stories about the bygone days of the Studio Era. On The Backlot provides current NEWS relating to motion picture’s cherished past. Plus, listen for wonderful snippets from your favorite classic films. Manny Pacheco is a Southern California television and radio personality, and author of the award-winning FORGOTTEN HOLLYWOOD Book Series. He’s been heard on KRLA, KFI, and KBIG; and a 33-year member of the American Federation of Television and Radio Artists, Screen Actors Guild, and youngest addition to the Pacific Pioneer Broadcasters. The paperback series shares America’s story through the eyes of character actors such as Claude Rains, Frank Morgan, Walter Brennan, Peter Lorre, Van Heflin, Andy Devine, Hattie McDaniel, Cesar Romero, Lon Chaney Jr., Marjorie Main, and Basil Rathbone.